Federal employees nearing retirement must make several important decisions. Besides selecting a benefit option, one of their biggest decisions is what to do with the money in their Thrift Savings Plan (TSP) account. Complicating this decision is a slew of options. Advisors to federal employees must not only understand these options, but also educate their clients and illustrate the myriad scenarios. Let’s review the three main TSP withdrawal options available to federal employees at retirement. The first option, and perhaps the easiest for a client to understand, is to leave all the money in the TSP. This is the easiest option because it requires no action by the client. As long as the client has at least $200 in the account, the money may stay in the TSP without withdrawals until the client is required to take RMDs starting at age 70½ (or the year in which the client leaves federal service if he or she is already more than 70½ years old). Federal employees may also roll over money from an IRA or eligible employer plan into the TSP. The second option is to make a one-time, partial withdrawal from the account. Clients selecting this option withdraw at least $1,000 while leaving the rest of the money in the TSP. Clients may select this option as long as they have not made a prior partial withdrawal, do not have a pending prior withdrawal request, and did not make an age-based, in-service withdrawal while still employed. The client will owe taxes on the taxable portion and may be subject to an early withdrawal penalty tax depending on his or her age. Also, if the withdrawal is not rolled over into an IRA or another eligible plan, it is subject to a 20% mandatory withholding for taxes. Requesting a partial withdrawal requires the submission of Form TSP-77, available from the TSP website or through the toll-free ThriftLine (1-877-968-3778). Clients may withdraw the balance (or part of it) as a lump-sum payment. If the withdrawal is not directly rolled over to an IRA or other eligible plan, it is subject to a mandatory 20% withholding for taxes. The withdrawal may be made as a series of equal monthly payments. The client may specify any amount of $25 dollars or more and receive monthly payments of that amount until the entire balance is withdrawn. (RMD requirements apply beginning at age 70½). The withdrawal may be set up as a series of monthly payments based on the IRS’s life expectancy tables. The initial monthly amount will be based on the client’s age and TSP account balance. The monthly payments will be recalculated every year on the anniversary of the of the first monthly payment. The yearly calculations will be based on the client’s age and current account balance. 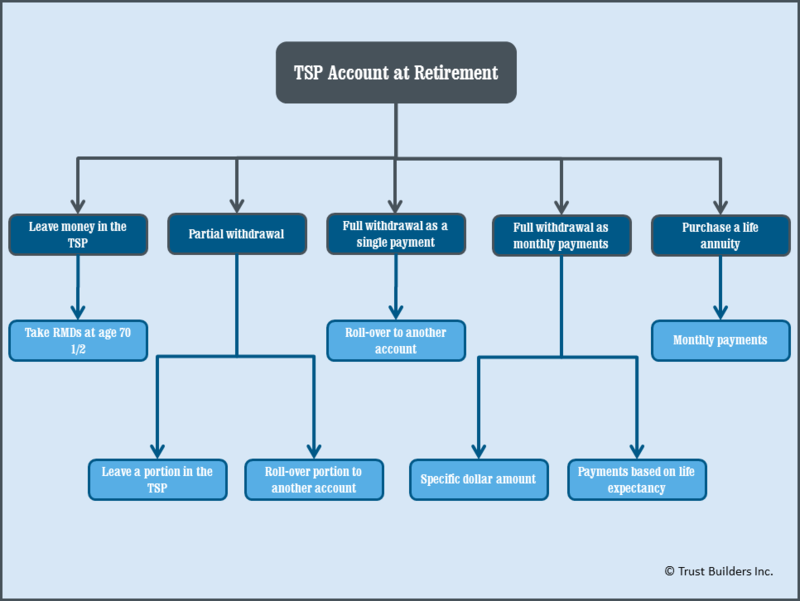 Clients may withdraw all or part of the balance in their TSP account to purchase a lifetime annuity from the TSP provider. The client withdraws at least $3,500 to purchase an annuity. (This $3,500 minimum applies separately to the pre-tax and Roth account balances). These annuities come in many varieties (e.g., with a survivor benefit option, with COLA) and should not be confused with the FERS, CSRS annuity, or monthly payments listed above. Confusingly, a client may choose to make a full withdrawal that is a combination of the options listed above. Requesting a full withdrawal required the client to submit for TSP-70, which can be found on the TSP website or through calling ThriftLine. Withdrawals are subject to federal and applicable state taxes depending on whether the withdrawals are from the traditional or Roth account. TSP accounts for the uniformed services may include tax-exempt withdrawals of contributions from service in a combat zone. The TSP website provides details on taxes. Faced with this dizzying array of options, retiring federal employees may be tempted to leave their TSP account untouched to avoid contemplating the options. This is where the value of a technical solution really comes into play. The Retirement Analysis Kit (TRAK) retirement planning software helps advisors assist federal clients not only in understanding how these different options might affect their own circumstances, but also in selecting the best option for their retirement needs. TRAK and TRAK-Online easily illustrate all these options (including the various federal annuity options and years required to get return of principal if they purchase a Life Annuity), cutting through the confusion and demonstrating how each option fits into the client’s broader retirement plan. TRAK and TRAK-Online also allow advisors to include the FERS, CSRS or CSRS Offset annuity, Social Security benefits, and any other assets or income the client wants to include in the analysis. In this way, advisors can provide a thorough retirement needs analysis for any client. Need help putting together a Gap Analysis for a federal employee? Watch our training videos for TRAK and TRAK-Online. If you are an advisor working with federal employees, you can benefit from our simple yet robust tools. Give TRAK or TRAK-Online a try today!